Don’t worry – I’m not saying we’ve totally cracked the all-time great of classical composers!! But our concert at St Peter’s Church with the Brandenburg Sinfonia on Saturday was a first on many levels – the first time at a new venue in Streatham and for me, the first time to have sung with a professional orchestra that it does feel like an achievement. It has been a humbling and amazing experience! Mozart’s prolific output is well-known and he is similarly notorious for the sheer quantity of notes in every piece of music. This has certainly been the case for our Spring Concert repertoire of the Coronation Mass, Ave Verum und Vesperae Solennes. The number of words we’ve had to tackle from the relatively unfamiliar psalms that make up the Vespers have made it “challenging but refreshing to be out of our comfort zone” (Rosalie, soprano section). 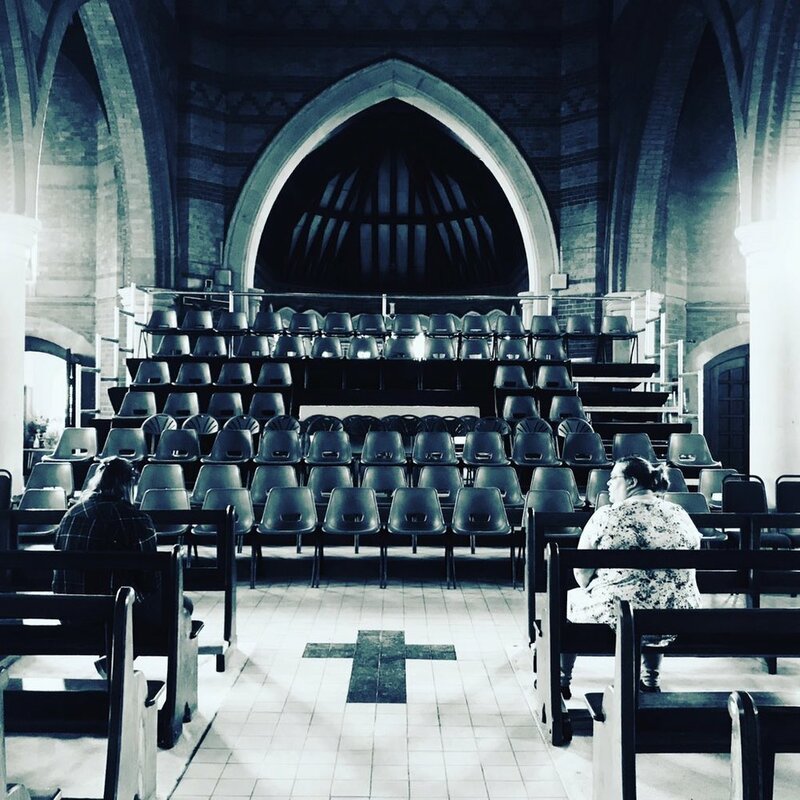 Ellie, our chair, and Hannah, concert manager, ponder our new seating shortly before rehearsal. Our first rehearsal at our new venue, St Peter’s, was on the Monday before the concert. Cycling up the steep hill from Streatham High Road, I would never have guessed that hiding at the top of some unassuming steps was such a beautiful church ,with gorgeous stained glass windows and intricate brickwork. I think we were all very grateful that we were able to change venues as the size of choir, orchestra and audience had made it necessary. It is a real testimony to the committee that the change ran as smoothly as it did. To say that our first rehearsal with the orchestra was daunting is an understatement for me! As an alto, I was sitting behind two enormous but very friendly French horns. We definitely appreciated their comradely glance of sympathy when our lovely conductor described our singing as a “sea of nothingness” at one point! But of course he was right; we needed to sing out and make the text carry over the additional sound and distance. I think we all came away from that rehearsal with tired voices and a few nerves. We have had so many positive comments from the audience, on social media and from our amazing conductor, that this concert really has been the highlight of our 2018/19 season so far. 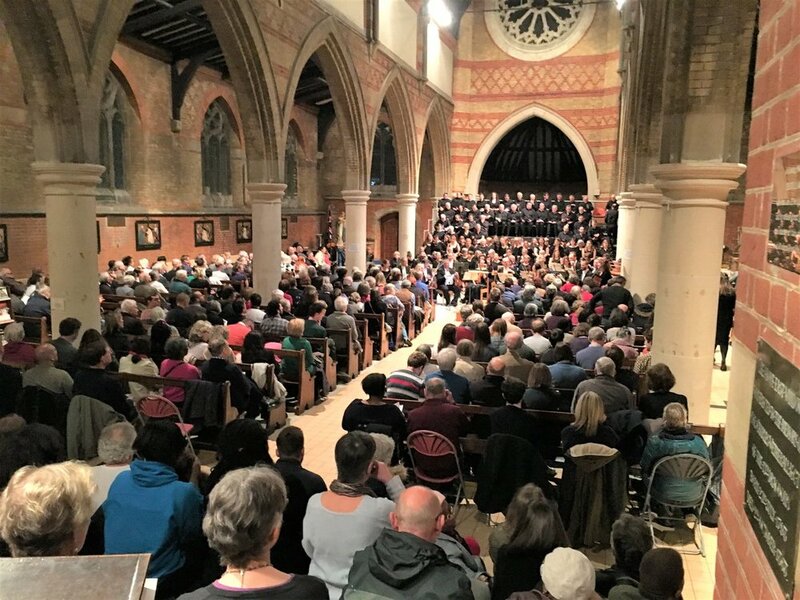 Streatham Choral & the Brandenburg Sinfonia performed the Coronation Mass, Vesperae Solennes de Confessore, Ave Verum and Exsultate, Jubilate with soloists Rachel Falaise, Catriona Hewitson, Andrew Henley and Jerome Knox. Conductor was Calum Fraser. With thanks to Anne-Marie Sanderson (@PhotogAMS) for the stunning photos. Older PostCome and Sing: We Certainly Did!